Mrs. Nellie Lucille Bush Lawhun, age 80, of Marion, Ohio, passed away Thursday, November 1, 2018, at her residence. She was born November 27, 1937, in Lewis County, Kentucky, a daughter of the late Deward and Flossie McFarland Bush. Nellie was a homemaker and she enjoyed spending time with her family and taking care of her dogs. In addition to her parents, she was preceded in death by her husband of 50 years, Marion Frances Lawhun; one great grandson, Brian Blevins; three brothers, Charlie Bush, Hesper Bush, and Welky Bush; and two sisters, Nona Eddington and Marie Russell. 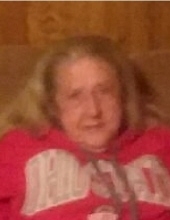 Nellie is survived by two sons, Roger Lawhun and Clayton Michael Lawhun, both of Marion, Ohio; four daughters, Patricia Shields of Vanceburg, Kentucky, Vine Buchanan, Cheryl Kirkland, and Charlotte Blevins, all of Marion, Ohio; 14 grandchildren; 24 great grandchildren; and three great-great grandchildren. She also leaves many other family members and friends who will sadly miss her. A graveside service will be held at 11:30 a.m. Monday, November 5, 2018, at the Granny Thomas Cemetery in Lewis County, Kentucky, with Brother Clarence Hall officiating. Friends may visit from 10 a.m. to 11 a.m. Monday, November 5, 2018, at Dickerson Funeral Home, 110 West Second Street, Vanceburg, Kentucky 41179. "Email Address" would like to share the life celebration of Nellie Lucille Bush Lawhun. Click on the "link" to go to share a favorite memory or leave a condolence message for the family.